The bifacial dual sided glass module (G2G) generates more electricity by converting direct, radiant and scattered solar energy on both the front and the back side of the module. The thinner tempered glass means less light trapping inside the glass increasing overall module efficiency. Proprietary IR resistant encapsulate increases the life expectancy and energy production over the life time of the module while maximizing the time per day the modules can generate electricity from the sun. Together these features can result in energy output as much as 30% higher than conventional technology. The total rated power output of the standard module ranges from 283 to 333 Watts. The Sfinkx bifacial dual sided glass module (G2G) generates more electricity by converting direct, radiant and scattered solar energy on both the front and the back side of the module. The thinner tempered glass means less light trapping inside the glass increasing overall module efficiency. Proprietary IR resistant encapsulate increases the life expectancy and energy production over the life time of the module while maximizing the time per day the modules can generate electricity from the sun. The unique hydroscopic properties of the encapsulate material provide a distinct advantage over traditional processes for both framed and frameless module manufacturing. Bifacial G2G modules also have a low temperature coefficient, which allows them to produce more electricity than conventional crystalline silicon solar modules at the same temperature. Together these features can result in energy output as much as 30% higher than conventional technology. This lamination method, with no multi-layer back sheet, results in reduced fire hazard and less probability of mechanical damage over the lifetime of the module. The G2G architecture provides dual sided protection of silicon materials from extreme weather conditions. Thinner glass ensures less heat, thermal stability, resistance to impact and elimination of micro fractures. A frameless construction requires less connections, materials and labor resulting in compact packaging and facilitated transportation. The bifacial G2G modules have a life expectancy of 50 years without danger of mechanical damage or temperature/ humidity-related delamination of the back sheet, resulting in a loss of energy production performance or outright failure. Bifacial G2G technology is a turning point in photovoltaic (PV) system technology. It replaces costly single-axis and double-axis mechanical tracking systems with less costly bifacial panels while achieving the same increases in efficiency. In an average system cost of $4/Watt for a conventional fixed ground-mount system, a double-axis tracking system would add about $1/Watt to the installed cost of the system (plus operations and maintenance costs) and increase energy generation by approximately 30%. The bifacial G2G panels will also increase energy generation by about 30% but only add approximately $0.50/Watt to the overall cost of the system. Net result – a 12.5% increase in cost will add 30% in energy revenue for system owners, virtually eliminating the need for tracking systems. 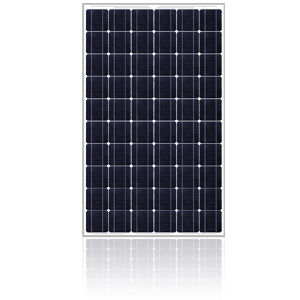 This breakthrough PV product is made up of 60 bifacial monocrystalline silicon cells with up to 20.5% module efficiency on each side. The total rated power output of the panel will range from 283 Watts to 333 Watts. Bifacial modules are ideally suited for applications with limited ground space such as military bases, municipalities, and schools. In addition, modern rooftop designs using reflective “cool roof” materials would maximize the harvesting from that enhanced reflectivity.